Dear Internet. I’ve been avoiding you. #sorrynotsorry. It’s been a bit of a crazy summer here, but I’ve been teasing my Facebook friends and Instagram followers for months with photos of the homemade granola bars that I make every couple of weeks or so, and it’s really not very nice of me to keep holding out. 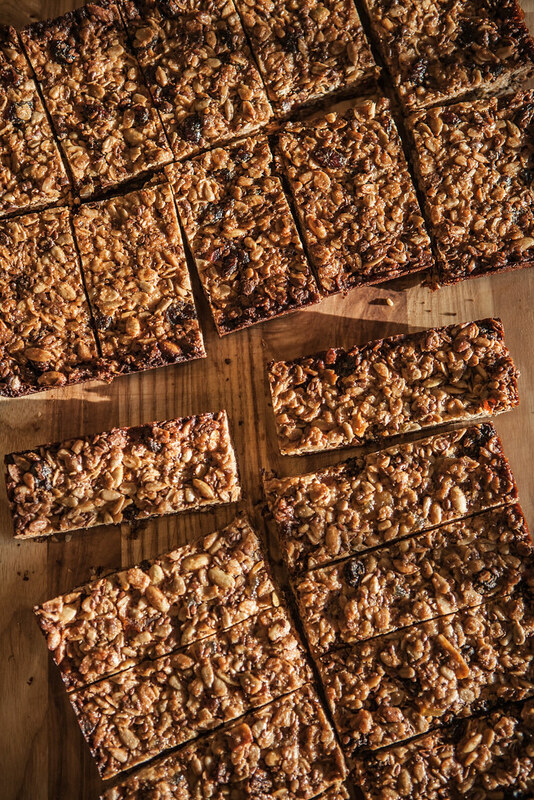 The first time I made these, I had been running (marathon training… yikes) for several months and had started to increase my mileage enough so that I was constantly on the lookout for a snack. Said snack needed to be able to stand in for a light breakfast, too, on occasion, so I wanted something healthy-ish and versatile. I had printed this recipe from some long-forgotten website and it seemed as good as any of the endless stream of results that google will happily spit at you if you are silly enough to search for “homemade granola bar”. Maybe you didn’t know, but granola, homemade stuff, and healthy snacks are, like, a trend or something. So I would encourage you to not get overwhelmed with the 2,440,000 results on google if there is something in here that you’re opposed to. Just switch it out for something you do like and call it improv. There are a few little shortcut-like tidbits I’ve come up with (after having made a double batch of these bi-weekly since around May) at the end of the recipe – please read all the way through before jumping in. Enjoy! 5-7 oz dried fruit, something similar to this mix. Publix sells a store brand tropical mix that I like. Preheat the oven to 350°F. Line an 8″ x 8″ x 2″ pan in one direction with parchment paper. Lightly grease the parchment paper and the exposed pan, or coat with a non-stick spray. Bake the bars for 30 to 40 minutes, until the edges are browned and the top is golden. Let cool on a baking rack until you can lift them out of the pan with your parchment paper, and then let them cool completely to room temp before cutting. I slice them into the size that works for me as breakfast/post-run snack but feel free to customize that as well. *If you do not have whole wheat flour, don’t fret. Just use oat flour, which is an equal amount (1/3 cup) of oats that have been processed in a food processor until coarsely ground. I think the texture is better when the grind is just shy of “fine”. I’ve made these with the whole wheat flour and the oats, and both work fine. **This is the tricky part: put whatever you want in here. I use my digital scale and just add the stuff I want until I get to 15 ounces, so it’s never the exact same twice. †I use this Earth Balance Spread that I found at Publix. It tastes awesome and gives the best holding power in my experience, i.e. the bars stick together and hold their shape really well. Otherwise peanut butter works well, as does almond butter. ‡I found that the Earth Balance Spread was harder to stir into my dry stuff. I started adding the spread to my butter when I melt it in the microwave so that it melts and gets good and liquid-y and I can whisk all my wet things together really well and the stirring is much easier at the end.